Ladio Veron is chief of the Takuara community, leader of the ATY GUAÇU – general assembly of the Guarani-Kaiowá – and the spokesman of the Guarani-Kaiowá on this journey on European soil. He is a history professor, graduated from the Federal University of the Great Dourados, but he lives as a peasant in his community. Currently Veron is visiting several countries in Europe, taking part in meetings and conferences aimed at drawing the attention of the international community to the difficulties faced by its people, the Guarani-Kaiowá, in Mato Grosso do Sul, Brazil. Since the time of the conquests of the Americas, the Guarani people have been involved in territorial disputes. On the Paraguayan side of the border, they were threatened by the Spaniards, on the Brazilian side by the Portuguese. Both attempted to conquer and dominate the vast lands of the Guarani-Kaiowá territory by subjugating and enslaving them. After the frontiers of the Spanish and Portuguese colonies were defined, the Brazilian government began a strong campaign of occupation of the indigenous territories by non-indigenous colonists, forcing the indigenous peoples to live in demarcated areas. The government supported the occupation of this region mainly for agricultural development, especially for soybean and sugar cane. Production of these crops was intensified between 1950 and 1970, forcing the indigenous communities into ever smaller areas. This whole process occurred amid violent conflicts and bloodshed, resulting in a traumatic expulsion of the Guarani-Kaiowá from their lands, and the drastic reduction of their population. The indigenous leaders who resisted this process were sent to a prison created on Bananal Island. 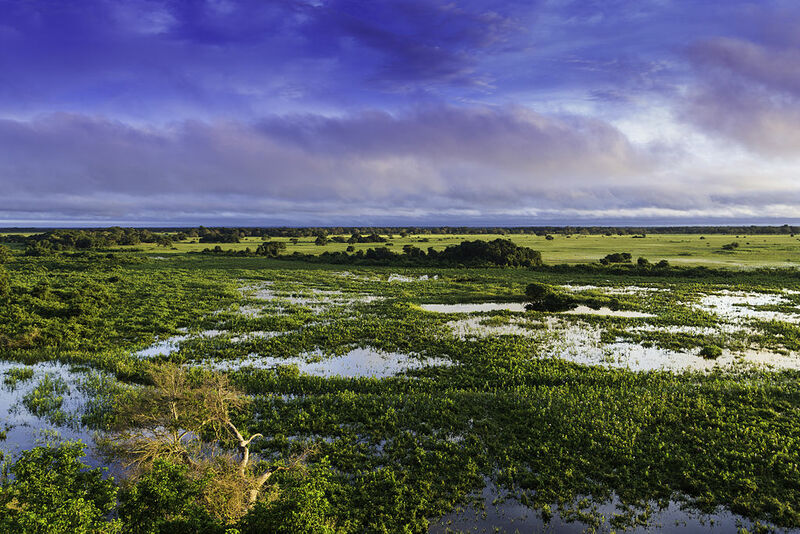 Guarani lands are home to incredible biodiversity and stunning natural beauty. Photo by Filipe Frazão. For the Guarani-Kaiowá, land is of vital importance, and the territory they have lost is considered the only place where their way of life and culture can be reproduced; it is where they have always lived and wish to remain, and without which they will die. The struggle over these territories pits the legitimate inhabitants of this land, the indigenous people who were there long before the arrival of the colonists, against the intruding landowners and agribusinesses that can depend on strong state support. This conflict has already taken over five decades, and in the last twenty years has cost the lives of more than 300 indigenous leaders who were merely claiming their rights. In addition to the murders, usually commissioned by farmers, there are also many cases of accidental or deliberate road deaths, an ever-present threat since the Guarani have been pushed into makeshift roadside settlements. Toxic chemicals used on the massive farms frequently leech into the soil and water, contaminating what little land the Guarani have left and leading to numerous deaths. Combined with informal housing and their precarious living situation, many indigenous children have died due to malnutrition and treatable illnesses like dysentery. The conflict wrought by the landowners against the indigenous community in the political arena is also extremely unequitable, as they have far more influence over the formulation of legislation, and have strong support from large companies. The so-called “Rural Bench” in the parliament is strongly united behind the creation of legal barriers to the regularisation of indigenous lands, but the Executive Branch is the greatest obstacle since it has primary responsibility for demarcating and granting legal recognition to that territory. When the 1988 Constitution was enacted, the Brazilian state committed itself to demarcating 100% of the indigenous territory by 1993, but today not even 50% of these lands have been demarcated. At the same time, agribusiness interests have only expanded. Over the past 20 years, more than 20 ethanol production plants have been launched within the Guarani-Kaiowá territory. Soybeans, sugarcane and livestock are also entering the region, but the indigenous community continues to live on the roadside without infrastructure, housing or basic services. 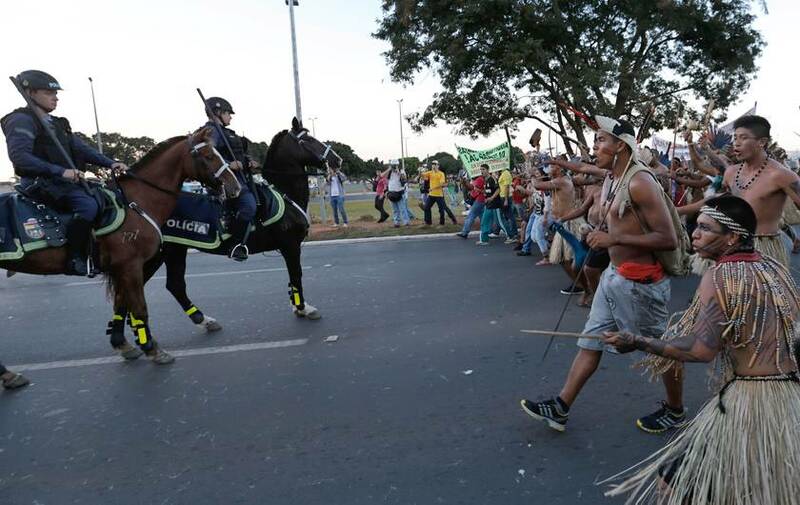 Recent weeks have seen many indigenous protests in Brasilia, calling for a greater recognition of their rights. Photo by Wilson Sterling. It was these difficulties, together with a desire to obtain support from the international community, that led activist Marcos Veron to travel around Europe in 2000. On that occasion Marcos visited Ireland and spoke at a conference organised by LASC. Tragically in 2003, Marcos was assassinated by ranchers who, like in most of the cases of indigenous murders, remain unpunished. Now, fourteen years after this brutal murder, his son Ladio Veron is following in the steps of his father and visiting several European countries carrying the same message of the suffering of his people and the urgent need to finally recognise their right to live on their lands. Here in Ireland, Ladio, spoke at a conference organised by LASC in Dublin, and delivered further talks in Belfast and Limerick. LASC accompanied Ladio on a visit to the Brazilian Embassy in Dublin where he delivered a letter emphasizing the need to hand over to the Guarani-Kaiowá community that has already been approved. Ladio also met with Front Line Defenders, and TDs from Solidarity-People Before Profit and Sinn Féin in Leinster House. Ladio has emphasized that they are not asking for anything more than what has already been decided, they are not pleading for new lands, they only want the final recognition that will give them the right to occupy and live in the territory that is already demarcated. Currently, only 1.6% of the territory of the state of Mato Grosso do Sul is indigenous territory. The indigenous chief also pleads with the international community to get involved in their cause and bring pressure to bear on the Brazilian government. The struggle of the Guarani-Kaiowá people for their lands is simply a struggle to be able to live their own way.